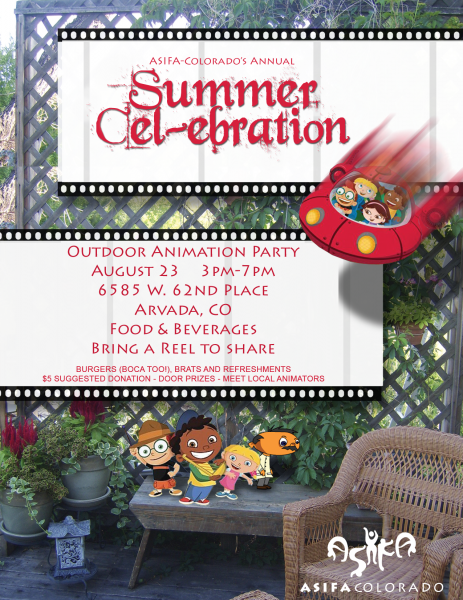 » Annual Animated Summer Cel-ebration! Join us the afternoon of Saturday, August 23rd for our annual Summer Cel-ebration! From 3pm to 7pm, come hang out with other Colorado animators and animation fans for a casual afternoon of schmoozing, eating, drinking and watching animation. This is one of our favorite events of the year. If you’ve got an animation reel, animated short or other project that you’ve been working on, bring it along to share. Make connections, have fun and relax on a beautiful Colorado late summer afternoon.